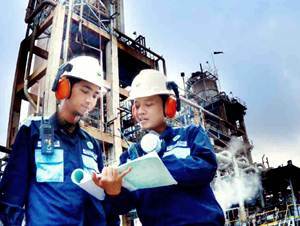 PT Petrowidada - PT PWD or later known as Petrokimia Gresik is a rapid growing company in Indonesia that is involved in chemical industry. PT Petrowidada operates primarily as a producers of Phtalic Anhydride (PA) and Malelc Anhydride (MA) products. PT Petrowidada is an affiliate company of PT Petrokimia Gresik, one of the largest fertilizer manufacturers in Indonesia. According to PT Petrokimia Gresik Annual Report 2015 as cited by JobsCDC.com, PT Petrokimia Gresik has an equity interest in PT Petrowidada amounted to 1.47%, the rest is owned by PT Royal Chemie Indonesia. PT Petrowidada was formed in 1989. The Company is based in Gresik East Java and its production facility - with installed total production capacity of 70,000 MPTY - is registered at Jl Prof Dr Moh Yamin SH, Kawasan Industri Gresik. Age around 20-30 years old. Minimum D3 Chemical Engineering or equivalent. Familiar with chemical company is preferred. Minimum S1 Mechanical Engineering or equivalent. Age around 35-50 years old. Minimum 10 years of experience in the related field with minimum 3 years of experience as Maintenance Manager. Preferably Manager or Assistant Manager specializing in Maintenance (Facility and Mechanical) or equivalent in Chemical Industry. JobsCDC.com now available on android device. Download now on Google Play here. Please be aware of recruitment fraud. The entire stage of this selection process is free of charge. PT Petrowidada - Assistant Foreman, Engineer, Manager Petrokimia Gresik Group February 2017 will never ask for fees or upfront payments for any purposes during the recruitment process such as transportation and accommodation.